Authentic French cuisine, without the attitude. 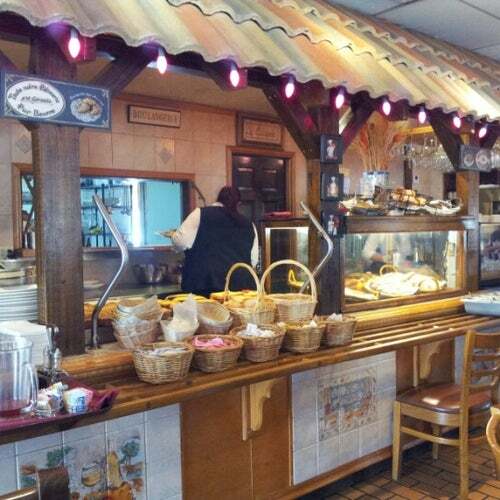 The bakery serves delicious treats and the restaurant is a favorite among locals, including the fancy gays. Get your Julia Child fix here. Very authentic French bistro food. Having lunch here reminds me of many places I have eaten in the South of France. It's not fancy, but the meals are served impeccably, and cooked n the French style. Yesterday was my 3rd visit, I had the brisket sandwich which was wonderful and tasty with swiss cheese, and BBQ sauce on it. I ordered it with the fries, which were the best I have ever tasted. They were fully cooked, and crispy on the outside. My partner had the Moules with the mariniére broth (you have a voice of several broths) . Frites, (steamed mussels with fries) a standard French lunch item. The omelette at the table next to us looked awesome. The staff all seems to be French speaking, as well as English, so go there if you want to practice your French ordering skills too!